"BENTO STORE" is our new brand to give you surprising. Your life would be more enriched with products of "BENTO STORE". We would give you "fun of cooking" and "pleasure of eating" through various design. Maison means "house" in French. 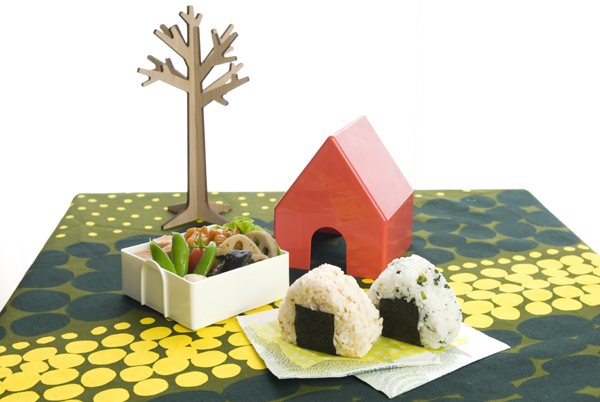 Lunchbox called "Maison de Lunch" is shaped house of delta roof and has two rooms. You can pack two pieces of "ONIGIRI" in upper space and bottom room can pack side dish or anything else. Also, the house is fastened by the band and it makes you easy to carry. 6 colors are available ! Copyright(c) 2000 MIYOSHI Mfg.Co.,Ltd.All Rights reserved.